Exeter (population 70) is located in west central Illinois in the north central portion of Scott County. County Highway 1 is the main roadway to and from Exeter. County Highway 14 also travels to the western edge of town. Exeter sits about 17 miles due west of Jacksonville. According to the Wikipedia web address of http://en.wikipedia.org/wiki/Exeter,_Illinois Exeter is named after a town of the same name in England. Future LDS leader Brigham Young once lived a 1/2 mile east of Exeter. There was a well on his property, "It is related that he first received spiritual appointments by gazing into the waters of this well where he observed the letters 'PC' , which he interpreted as a sign that he should 'Preach Christ', Others said the mysterious apparition meant 'Plow Corn". 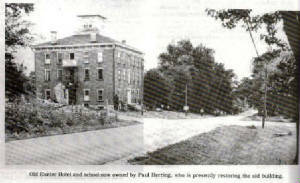 The building was still standing in 1976 and was owned by Paul Herring. The Masonic Lodge was located on the 2nd Floor. The building was erected in 1860 by Rudcil Arnold, a local farmer, and was called the Exeter Hotel. When it was built it was the largest building that stood between Quincy and Decatur. The building was well known for the "Rude's Balls", dances that were held at the building because of its springy floor in the dance hall. The "Rude's.Balls" drew dancers from as far away as St. Louis. Dances continued through the 1920s. It is said that General Ulysis Grant forbid his Troops to use the Hotel in 1861. William Anderson bought the hotel in 1870. 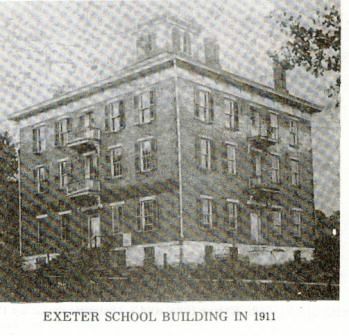 We only know that Exeter offered high school classes by the writing on one of the photos which was taken in 1889. 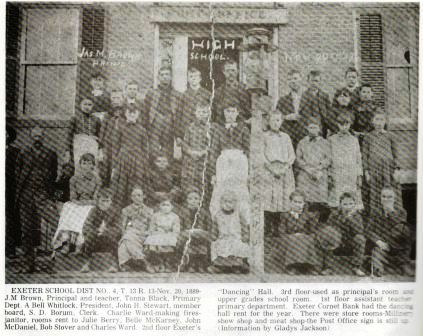 The writing specifically reads "High School". If you have any further information about Exeter High School please write to us via the means listed below. "Exeter School Dist. 4, November 30, 1889. J.M. rown principal and teacher, Tanna Black Primary Dept. A. Bell Whitlock, President, John H. Stewart, member board, S.D. Borum, Clerk, Charlie Ward, making fires - janitor, Rooms rent to Julie Berry. Belle McKarney, John McDaniel, Bob Stover, and Charles Ward. 2nd Floor Exeter's "Dancing" Hall, 3rd floor used as principal's room and upper grades school room, 1st floor assistant teacher primary department. Exeter Cornet Bank had the dancing hall rent for the year. There were store rooms, Military show shop, meat shop, the Post Office sign is still up. Information by Gladys Jackson." We believe that Exeter High School offered boys basketball, competing with other schools in the area and in the IHSA State Tournament. We believe it is possible that track and baseball were also a part of the sports program at Exeter High School. School team nicknmae, uniform colors, fight song, coach's names, team records, and other items would be a welcome addition to the Exeter High School page. We can imagine that the kids from Exeter had a very active time at Exeter High School. Dances, chorus, band, plays, and clubs were all likely a part of the EHS experience.